Hubble bubble. Toil – and so much trouble. It’s been a while since I penned a post. Titles sit alphabetically festering in my file. Symbols, waiting to lead into eloquent cries of woe. Painful shrieks of angst. Or even, you never know, stuttering odes to joy. Too much turmoil, anyway, to stuff into a fewer-than-a-thousand-words-long post. Which is why I’m resorting to … food. Don’t we all? Sometimes? When the going gets tough and the lure of toast, cake, cheese or chocolate – or sausages – becomes overwheming? I’ve been inspired by a silly picture going around Facebook which, yesterday, made me snort out loud. Then, last night, I cooked one of our favourite one-pot meals. And in my head I was back there: Swaziland. Yes, no matter how far time removes me from those turbulent times, still, a sausage, takes me back. And if you’re sniggering, please stop. It’s not a euphemism. I occasionally think about doing a campfire cookbook. Recipes for those days when you’re stuck in the African bush, remote from anywhere, with limited food, cast iron cauldrons and an open fire. But the market for that, let’s face it, is likely to be small. And then there’s the other equipment you’d need. Okay, so at Kalambo Falls, Zambia, I had none. No, I lie. I had a kitchen. Aka, vehicle with tailgate. Great kitchen… not. It helps if you have caravan to hand with a battery-operated fridge. And if it’s working. Then, if you have water, you can whip up iced coffee, with Coffee Mate. Which I did. But that was a once-for-all-time occasion. And, let’s be honest, designed to impress You-Know-Who. Mostly, I had an old Coca Cola fridge. It didn’t work, except when engineer Al came to stay for two weeks. Elderly Al from the US of A was a quadruple-bypassed star. The thing ran on paraffin – which we had – and his magic touch got the temperamental beast going. Sadly, his magic wasn’t infectious – and soon it was back to being an insect-rodent-baboon-proof metal storage space, perfect for fresh fruit and veg. Most evenings out in the bush, in our camp at the foot of the Lebombo mountains, under the shooting-star skies, we ate meat. Day one, fresh meat in the cool box was still safe to eat. Maybe chicken, as curry with tinned peaches. Or chunks of culled wildebeest, with potato chunks and tinned waterblommetjes. South African waterblommetjebredie. Day two and ‘one I made earlier’ would defrost in time for dinner. 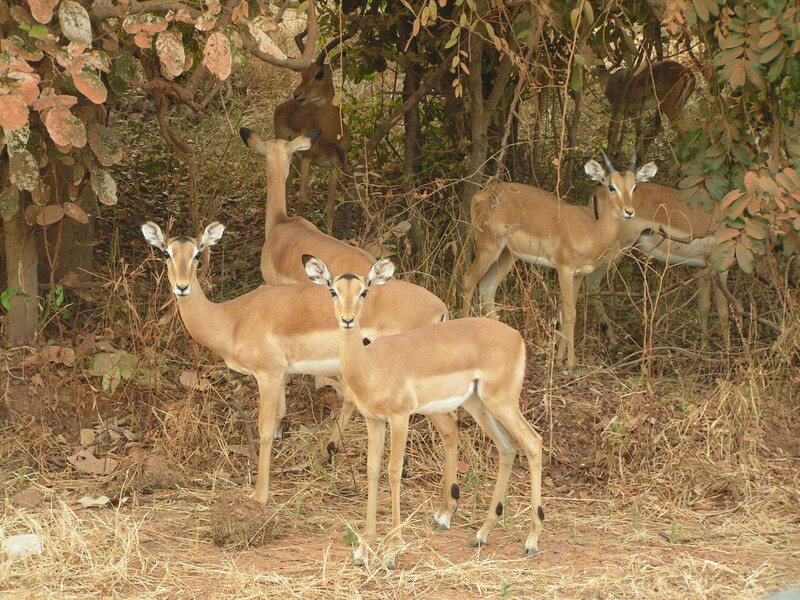 Impala goulash, or Wildebeest bourguignon. 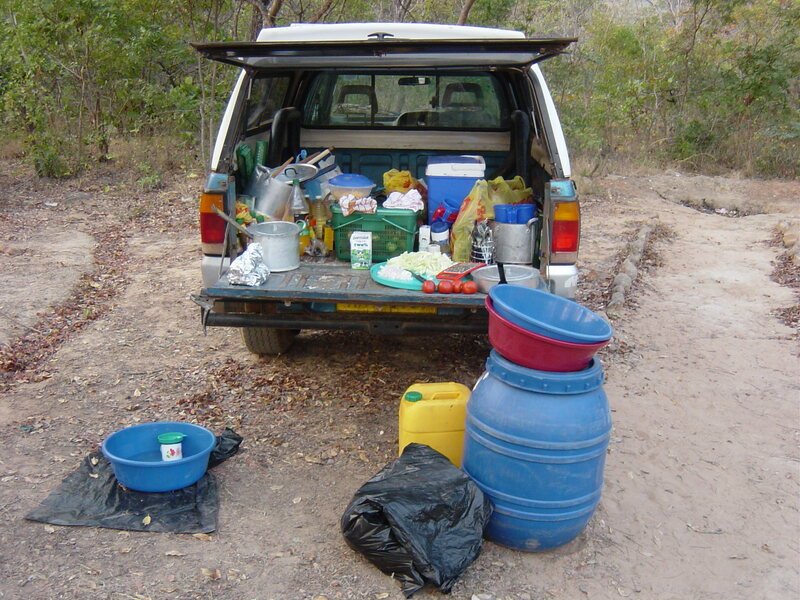 Cooked in a proper kitchen, many bad-road miles -and a lifestyle – away. More boxes of pre-cooked wild animal concoctions would be stashed in a freezer on the Wildlife Reserve. We’d pick up one on our way homeward from digging. Each evening, while Dudu, my Swazi helper and I prepared the meal, a certain tall Texan was in charge of snacks. Tinned sardines on Provita biscuits, with a dash of hot pepper sauce. Or the best guacamole, ever. Great nets of avocadoes sat waiting to be mashed and mixed with chopped fresh tomatoes from our safe metal store. Tex and a helper would chop onions finely and create – yum – a new taste sensation. Guacamole hadn’t reached England yet, then. Day three, if we’d brought Russian sausages, might be Cassoulet day. And that’s the recipe I’m sharing today. Not Cassoulet as you may know it, but to me, always the best. Fry the onions slowly in the oil or fat in the cauldron, till soft, over a pile of embers and ash at the edge of the fire. Add the sausages and move to hotter coals so the sausages brown a little. Add the cabbage and stir for a minute or so, then add the stock and wine/juice/cider. Add caraway seeds to taste (I use about 2 teaspoons for us). Add the bay leaf. Drain the beans (and rinse if you can but don’t fuss if you can’t) and add to the pot. Stir carefully. Put on the lid and move the cauldron to low heat. Leave for 10 minutes then check the liquid. Add more if it’s evaporating too quickly. Check now and again. After 35-40 minutes it should be done. If the cabbage looks tender and the sauce looks well combined it’s probably there, but as long as there is liquid in it you can leave it longer if you like. If you’ve used fatty sausages then the sauce should by now be quite thick. If it’s not – or if you’ve used low fat sausages – you may need to thicken it. I use a little cornflour – 2 or 3 teaspoons, mixed with a little water. Stir into the pot over the heat until it thickens. Now add mustard to taste – I use two teaspoons. Stir, serve and enjoy! And be grateful for that hob, that kitchen, that sink and that running water. No matter how humble, believe me, it’s a blessing. This entry was posted in Simple Food for Simple Folk (like me), Socks, spoons, stones and sunsets, Travelling, Zambia and tagged guacamole, impala, iron cauldron, Lebombo mountains, open fire, paraffin fridge, Russian sausages, sausages, Swaziland, waterblommetjebredie, wildebeest. Bookmark the permalink. Having just been presented with a Paula Wolfert (typically) overcomplicated recipe for cassoulet by Higher Authority I shall hit back with yours. Given the nature of Costa Rican sausages I shall not be needing cornflour. When I moved to France the elderly gentleman down the road was still cooking in a cauldron over the fire: things were in glass jars and earthenware pots and divided by slim planks of wood. 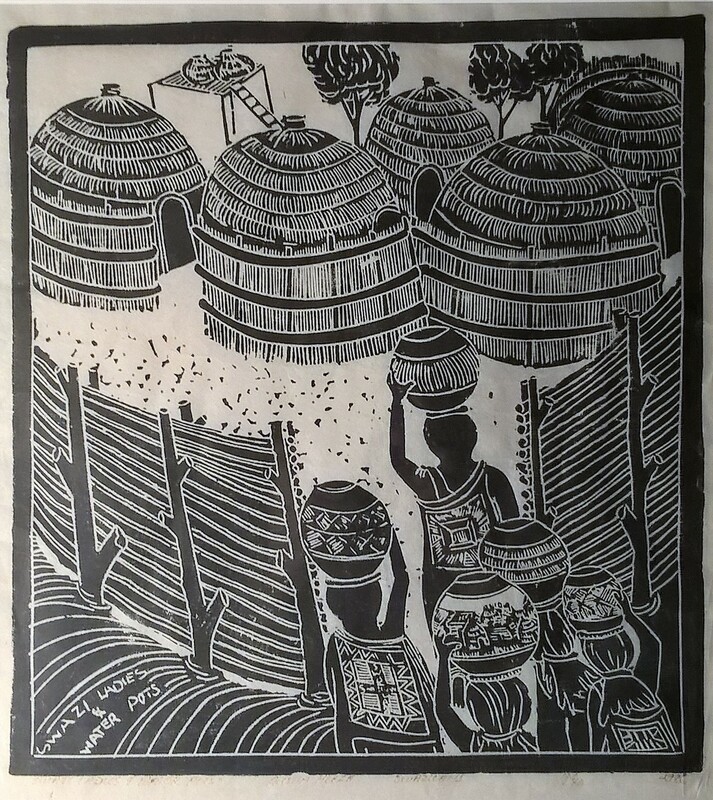 Another neighbour showed me her cooking pots from the days before her son moved her to an all mod cons house which she hated….flattish earthenware dishes with convex lids to be put in the ashes of the fire and heaped with hot coals so that the contents cooked while she was busy around the farm. i admire your ingenuity – and patience – dealing with temperamental fridges, camp fires and heat and keep thinking that I might respond more positively to a male perfume that promised sausages than one promising savagery…or is that just age? 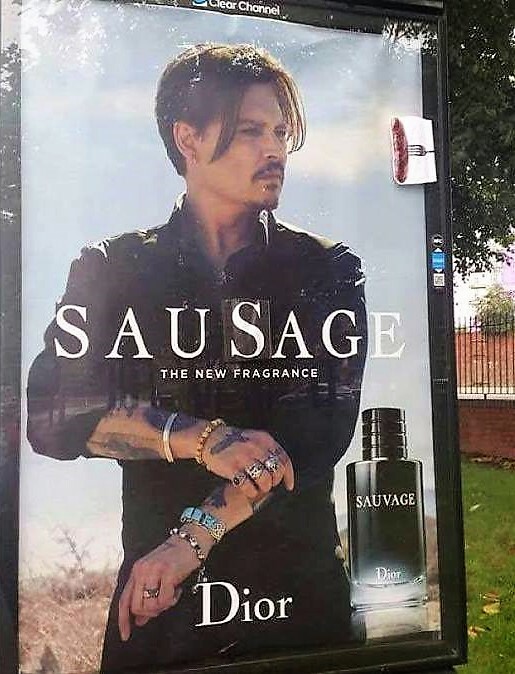 Ha – I’m not sure the sausage scented cologne would be a big seller but I do know what you mean! Life is definitely too short for over-complicated recipes in the pursuit of authenticity. I was devastated when I learned that ‘my’ recipe for cassoulet ( a little more complicated than this but no goose based ingredients) was deemed ‘not real’ by a chap building a UN refugee shelter in Swaziland. I thought, frankly, he should be grateful anyone was attempting anything close! Are those French pots Marmites? I love anything made by hand including cooking dishes and have just bought some that require soaking before use. Did I say life was too short for complicated recipes? Ha, now I’m soaking casseroles! What are Costa Rican sausages like? From what I recall marmites are tall pots mostly used for big stews – the things with a boiling bird, a ham hock and goodness only know what else. I don’t remember her calling her pots by a special name but I bet every region calls them something different. English in France used to buy the earthenware dishes and wonder why they broke asunder once in the oven…they did not know that they needed soaking! Costa Rican sausages seem to contain a vast amount of fat….so I make my own when I want something that does not shrink to a worm in the pan. The cheek of that man! You’d think he would be grateful to have even an approximation of cassoulet in the circumstances! Mark you, should you ever have the desire to be attacked, trolled and denigrated by harpies, just put up your cassoulet variation on one of the ‘living the dream in France’ blogs…. My new pots are Spanish and Portuguese and came with instructions to soak or I wouldn’t have know. Not sure I like the sound of worms in the pan Helen! And mightily impressed you make your own sausages. Yum! I’m sure the best place to eat it is under the stars and wondering which uninvited supper guest might charge through the bush to join you! Indeed it is – though if you also have to wash the dishes to avoid the exotic rodents becoming a plague then it’s a bit of a drag for the camp manager… unless she has learns (I did) to delegate. Your posts are always a delight! Based in this one, methinks you have many wonderful stories to share! Thank you for bringing a smile to my face at 3:00 a.m., as I prepare to sleep for a few hours. 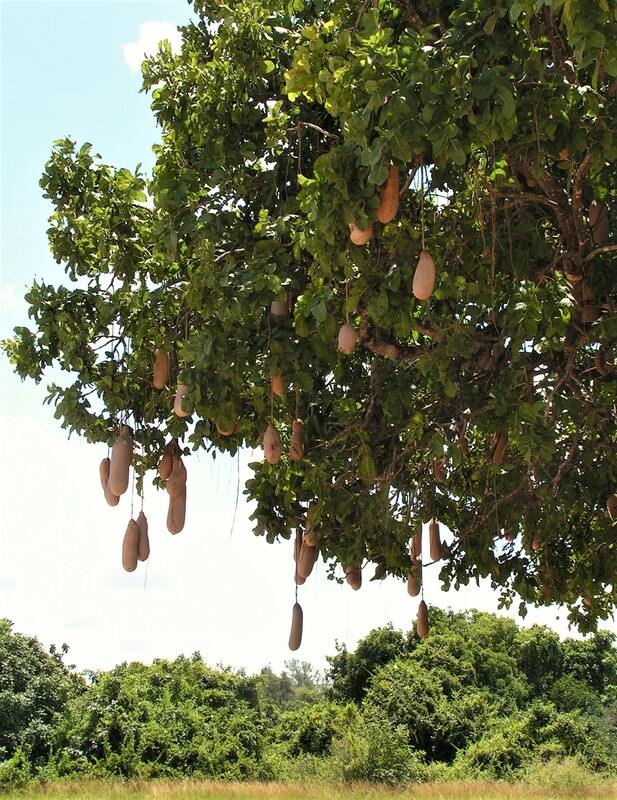 One question … Do sausage trees actually exist? I shall have to research this in the morning! No fake trees on my site! Of course there are such things 🙂 The sausage fruits are very heavy and can cause dents in vehicles if they drop off at the wrong moment and bruises if they fall on fragile egos – sorry – people (too much Trumpery)! PS: there’s a link to my ‘Swaziland’ page in the article or at the top of the home page if you feel like reading the full story… It’s the place where the direction of my life changed. I will definitely be checking out that link! I was fascinated by the brief glimpse I got last night!